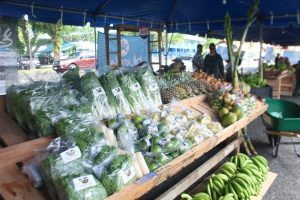 The produce and food stalls at Suiga Ula attracted streams of people hours before the opening of the We Are One Flag Day Festival. While some vendors were just setting up, stalls selling vaisalo, pistachio, faalifu, corn beef, turkey tail luau and lots of other cooked food were already doing good business. Tents with taro, bunches of banana, breadfruit, coconuts and a variety of vegetables and fruits were also getting a steady flow of customers. 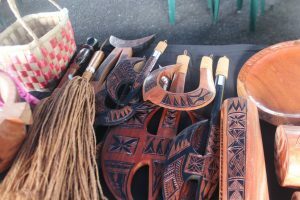 The Territorial Administration on Aging stall had an array of handicrafts: war clubs, tanoa, canoes, upeti boards, pandanus hats, table mats and other woven handicrafts. 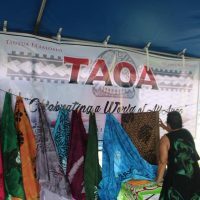 Elei printed materials of all colors were hanging on one side of the TAOA tent. Farmers are also selling sugar cane, lettuce, papaya, different varieties of lemons, star fruit and cold niu. 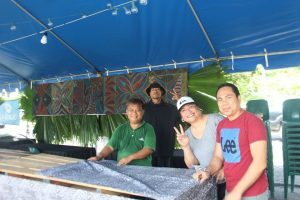 Art students from the American Samoa Community College wwre setting up the food section as We are One Festival Co-ordinator Tricia Suesue was giving directions for the aiga table. There’s be more vendors and entertainment throughout the day tomorrow for the Family Day and the fireworks show at night.